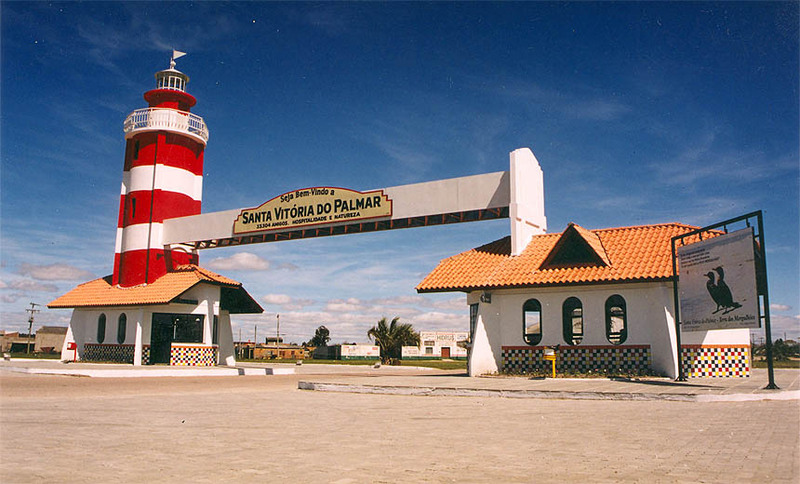 Santa Vitoria do Palmar is a meteorite find from the state of Rio Grande do Sul, at the southernmost tip of Brazil. Although the first fragments were found in the summer of 2003 it was not before the end of 2005 that Santa Vitoria was confirmed and classified as a meteorite. The author made contact with the finders and other people involved in the discoveries and was therefore able to contribute to the research of the circumstances of the 1997 fireball and the meteorite findings of 2003 and 2004. The extensive information collected sheds some light on the background of this particularly interesting meteorite and gives an idea of the dedication and endurance of the Brazilian field teams involved. At crack of dawn on June 25 it seemed that this was the beginning of a day like every other day for the picturesque fishermen village of Santa Vitoria do Palmar at the south eastern tip of Brazil. And yet the stage was already set for a unique natural spectacle which was just about to happen. The main act was already approaching with the speed of some 40,000 miles per hour in the form of a frozen chunk of rock the size of a refrigerator. All of a sudden at 07:00 am a bright light appeared in the clear northern sky and continued in a high speed trajectory along the coast and down towards the village. The descent of the fireball blazing in blue and green was marked by the coal black smoke trail that followed it. Accompanied by a series of loud thunder claps the fiery intruder ended its journey not far from the outskirts of the village. Hundreds of eye witnesses in Santa Vitoria do Palmar and on the far side of the border to Uruguay in the city of Chui, followed spellbound the spectacular descent. 19 year old Jacson Costa de Souza was alarmed by a wheezing sound that continued for a couple of seconds until suddenly a thundering sonic boom made the walls of his home tremble. Like him many inhabitants of Santa Vitoria were scared up by a series of thunderstrucks and a loud final explosion which rocked the foundations of their homes. Minutes after the Event, local radio stations were flooded with calls of terrified eyewitnesses who reported their experiences under the immediate impression of the event. 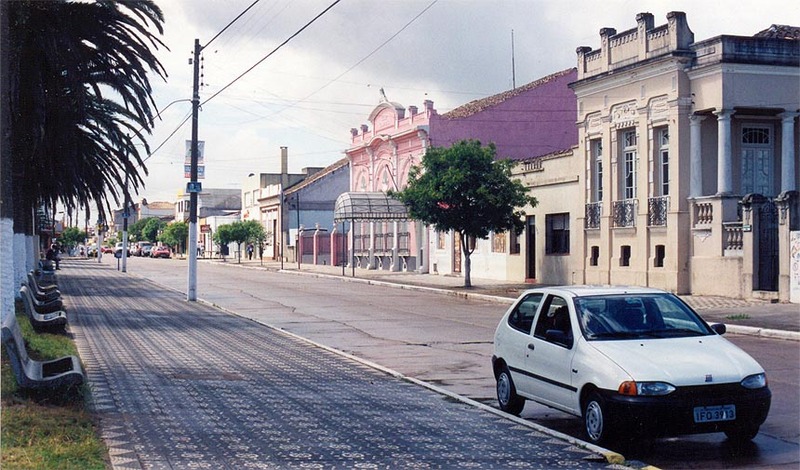 Radio stations based in Uruguay reported that the sound of the explosion was heard as far as Rocha, which is roughly 120 km south of Chui. A number of eye witnesses who had followed the descent from north of Santa Vitoria agreed that the impact had occurred in an area named “Chácara dos Pinhos”. However with eyewitness reports still coming in it soon became clear that “Chácara dos Pinhos” was just close to the trajectory and that the object had continued beyond this point. All the accounts taken together suggested that the impact, if one had occurred, must have taken place in the area between the harbour of Santa Vitoria do Palmar and the northern outskirts of Chui. 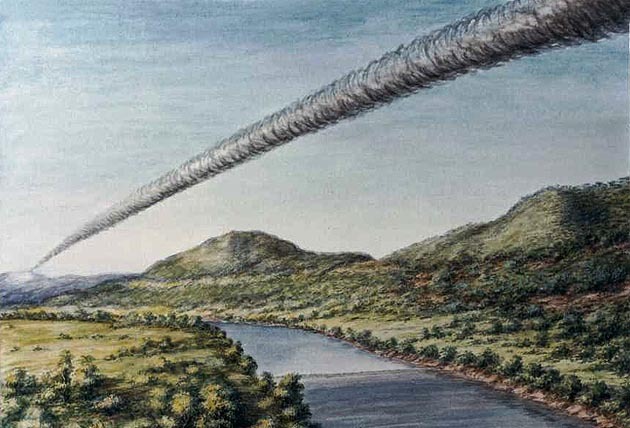 A number of eye witnesses who had followed the descent from north of Santa Vitoria agreed that the impact had occurred in an area named “Chácara dos Pinhos”. However with eyewitness reports still coming in it soon became clear that “Chácara dos Pinhos” was just close to the trajectory and that the object had continued beyond this point. All the accounts taken together suggested that the impact, if one had occurred, must have taken place in the area between the harbour of Santa Vitoria do Palmar and the northern outskirts of Chui. The search for the crashed mystery object started the same day. On the Brazilian side of the border the search was organised by the commanding officer of the police Luiz Cavalheiro. Also the police based in Chui, on the Uruguay side put together a search party which started around noon to check a couple of fazendas north and northeast of Chui. None of these missions led to any discoveries and both were ended at dusk. A request which was sent the same day to the Airbase of Santa Maria revealed that their radar did not register any object in the district of Rio Grande do Sul that morning. A request to the nearby weather station assured the police that no thunderstorm was present at the time of the fireball sighting. The following day, June 26. ZERA HORA, the newspaper of the state capital of Rio Grande do Sul, printed a detailed account of the events of the past day. 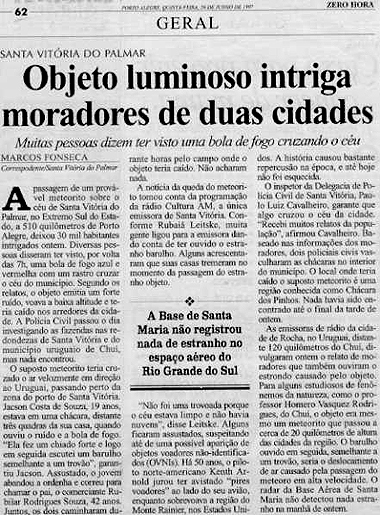 Under the headline „Objeto luminoso intriga moradores de duas cidades“ the author Marcos Fonseca quotes a number of eye witnesses and presents a first chronological compilation of the events which ends with the unsuccessful search in the area of Santa Vitoria do Palmar. 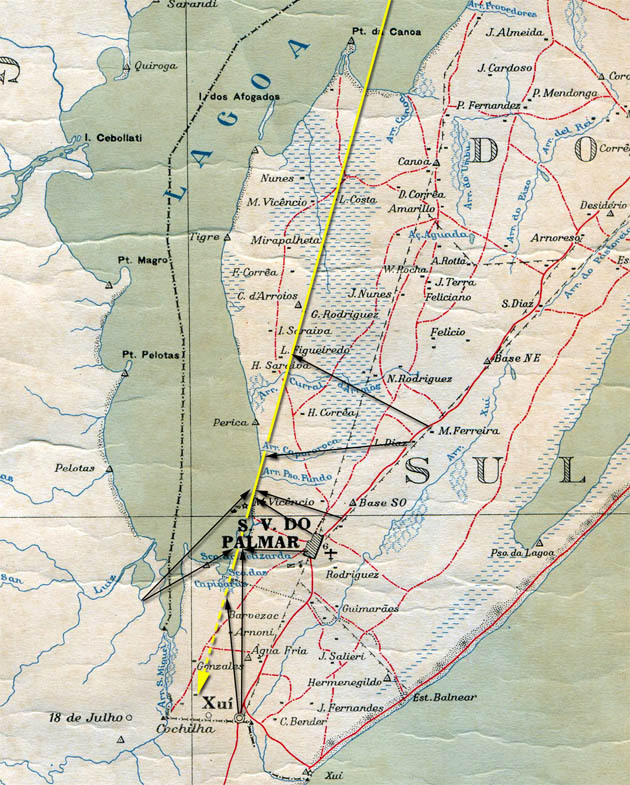 Meanwhile it became clear that the trajectory span from the north along the edge of the Mirim lagoon and roughly towards the direction of Chui. Most eyewitnesses agreed that the object had crashed before reaching Chui in the vicinity of Santa Vitoria do Palmar. The probable impact zone was assumed to be west by southwest of the village. The newspaper article from the 26th also offered a first scientific explanation of the phenomenon. 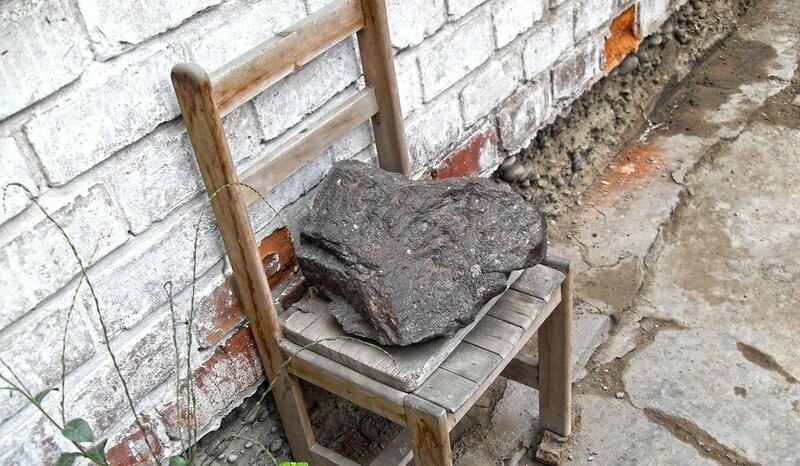 Professor Homero Vasquez Rodrigues from Chui explained “that the object was a meteorite that passed in an altitude of 20 km over the city and that the thunder is due to the sound of the shockwave of air compressed by the meteorite”. However it is doubtful if Professor Rodriguez did actually see the fireball.